University of Newcastle (UON) staff and students involved in research need to ensure their work is conducted responsibly, ethically and with integrity. They also need to operate within the principles outlined in the Australian Code for the Responsible Conduct of Research (2018) ("the Code"). While the principles of the Code apply to both staff and students, this page provides advice about how UON will manage concerns that involve researchers, research supervisors and other staff. For concerns about the conduct of students involved in research, contact UON Graduate Research. What is considered to be a breach of the Code? How serious are breaches of the Code? What should I do if I suspect a breach? What type of information should I share if I’m concerned about a possible breach? What if I don’t believe my concerns have been addressed at the local level? How will UON deal with anonymous concerns? What if the concern needs investigation? What if a breach is evident? What if someone raises a concern or allegation about me? Where can I get support if I’m involved in an alleged breach of the Code? Where can I learn more about what's expected of me? Is bullying considered a breach of research conduct? 1. What is considered to be a breach of the Code? 2. How serious are breaches of the Code? As described in the Code, a ‘breach’ is a failure to meet the principles and responsibilities of the Code. Breaches can occur on a spectrum from minor (less serious) to major (more serious). A 'minor breach' may be a technical issue, unintentional mistake or issue resulting from inexperience. involve the wilful concealment of activities or behaviours that might result in any of the above. 3. What should I do if I suspect a breach? Discuss any concerns you have at the local level first, ideally with the research supervisor. You may find that your concerns are based on simple misunderstandings, unintentional mistakes, or other minor issues that can be quickly and easily addressed. 4. What type of information should I share if I’m concerned about a possible breach? Before you raise any concerns, be prepared. Share enough information to help the advisor understand the situation and provide advice about different strategies to help resolve your concerns. 5. What if I don’t believe my concerns have been addressed at the local level? If your concern involves the conduct of a UON researcher, supervisor or other staff member, you can lodge a formal concern with the Pro-Vice Chancellor Research and Innovation. 6. How will UON deal with anonymous concerns? For matters involving researchers, research supervisors or other staff, the Pro-Vice Chancellor Research & Innovation will determine if the concern relates to a potential breach of the Code and warrants assessment, or is not related to research conduct and should be referred elsewhere. How is a concern assessed? providing the Pro Vice-Chancellor Research & Innovation with a preliminary assessment report. 7. What if the concern needs investigation? The Pro Vice-Chancellor Research & Innovation will determine if a concern requires formal investigation. This involves establishing a panel to review the allegation, who then provide the Pro Vice-Chancellor Research & Innovation with a report. 8. What if a breach is evident? Where a breach is evident after investigation, the Pro Vice-Chancellor Research & Innovation will refer the matter to the Deputy Vice-Chancellor Research & Innovation for resolution. 9. What if someone raises a concern or allegation about me? If you are the subject of a formal concern, you will receive specific advice in writing and have the opportunity to respond. You’ll also be advised of progress along the way. Confidentiality is an important part of the process and UON has measures in place to help protect your confidentiality. 10. Where can I get support if I’m involved in an alleged breach of the Code? 11. Where can I learn more about what's expected of me? 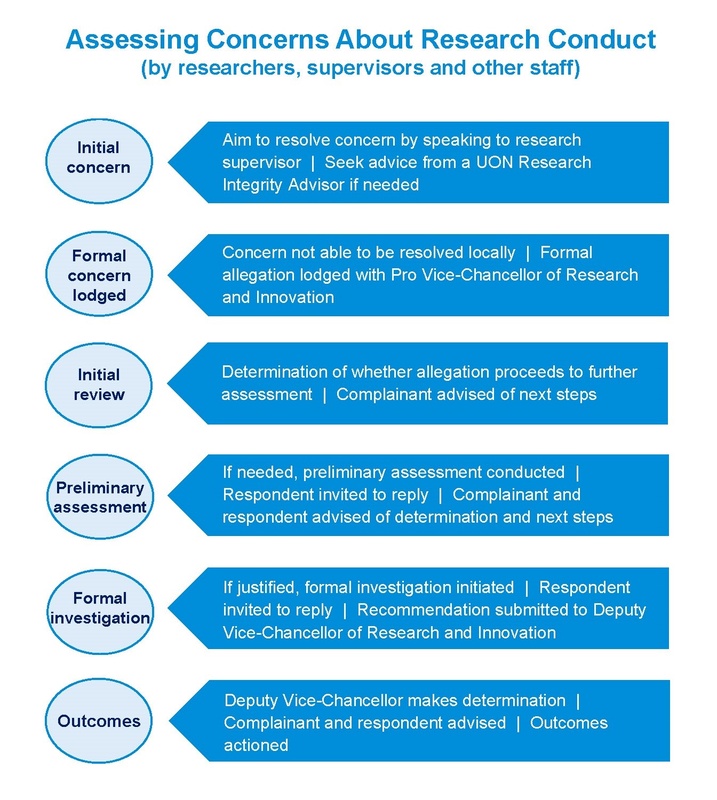 Review UON’s policy and new procedure for investigating concerns about the conduct of research by UON staff. Complete UON research integrity training in Discover. If you have concerns, try to resolve them locally first. Escalate concerns if they haven’t been or can't be resolved within your team, school or faculty. 12. Is bullying considered a breach of research conduct? Research breaches typically involve activities or behaviours that go against the responsible and ethical conduct of research and the Code. If you see or experience bullying, harassment or discrimination, report it as soon as possible to your supervisor or Head of School. You can also contact UON's Campus Care, Human Resource Services or Complaints Office.